The materials used in the hotel’s architecture and interior design pay homage to the Caribbean ecosystem: the walls, covered in coral stone, add a natural beauty to its interior spaces; the furniture is made of fine woods from the region, giving the hotel a comfortable and natural ambience; handicrafts made with natural fibers are used as decorations in all the hotel’s indoor areas. Wild cane, a natural fiber typical of the Colombian Caribbean region and which is used to make the traditional “vueltiao” hat, is the main element used in the hotel’s interior design. The walls, furniture and some of the decorations are made from this fiber, making the Hotel Movich Cartagena a unique and exquisite place. Local character fills every corner of the hotel. Even the aroma inside the hotel is pure Caribbean: fresh and inspiring like the Colombian Atlantic breeze. 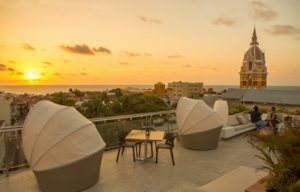 The terrace at the Hotel Movich Cartagena enjoys the best view in the city: a 360° panorama of Cartagena that takes in the Church of San Pedro Claver, the Cathedral of Santa Catalina de Alejandría, Cartagena Bay and the Simón Bolivar Plaza, as well as other fine historic sights of the walled city. A block of rooms has been set aside at the Movich Hotel. Below you will find discounted rates per night according to different types of rooms. To reserve your room, please send your inquiry to Genny Mendoza at genny.mendoza@movichhotels.com and reference "Matt & Ximena Wedding" in the subject. To secure the above rates, please let her know that you want the group hotel rate code 328747 applied to your reservation.